Provide comfort for the family of William Sturrock with a meaningful gesture of sympathy. HAMPDEN - On February 3, 2019, the world lost one of the greatest dads, according to several local experts. William Charles Sturrock was born in Somerville, Massachusetts to Alexander Milne Sturrock, an immigrant from Scotland and Sadie Wilson, a Nebraska pioneer with Canadian heritage. His birth-date of the 23rd August, 1929 predated the Great Depression by 2 months, and like most of his generation, he grew up hard-working, self-reliant and dedicated to the service of others. He volunteered for the US Air Force after graduating from North Quincy High in 1947. After working as a truck mechanic, and enjoying his Alaska tour during the Korean War playing semi-pro hockey, he returned to the Boston area and married his sweetheart Barbara Perkins in 1954. He could not afford college, but his affinity for tools and using his hands earned him an apprenticeship as a machinist. He finished his training at Portsmouth Naval Shipyard as a Master Machinist in 1961. He became recognized for his uncanny drafting skills and was appointed as the first engineering technician to serve as liaison from the Machine Division to Submarine Design, and ultimately retired with over 35 years of federal service as Chief of the Design Section in 1991. After retirement, he worked part-time for a pharmacy in Dover, NH, delivering medications for elderly and shut-ins. He continued with his passion for making children’s toys in his basement workshop, and enjoyed canoeing and hiking in the White Mountains. He relaxed by watching his hometown Boston teams, especially the Red Sox and the Bruins, with a bitter IPA in hand. He moved to the Avalon Village in Hampden in 2014 with his wife, but after having a small stroke served his last tour of duty at the Bangor Veterans Home. He was known by all as an honest, reliable, quiet man with a wry sense of humor who never spoke poorly of others. He is survived by his wife of 65 years, Barbara; his older son, William with his wife, Mary-Michael Billings of Orrington, his daughter, Mary with her husband, Ray Grimes of Garner, North Carolina, and his younger son, Charles with his wife, Kathy G. Sturrock of Falmouth, Massachusetts. 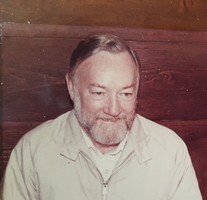 He has 9 grandchildren: Mikaela Wentworth, Alexander Sturrock, Benjamin Sturrock, Daniel Krawiec, David Krawiec, Evelyn Sturrock, Allison Classen, Gerry Grimes and Michael Grimes. He is blessed with 6 great-grandchildren: Asa, Iris, Orin, Lanie, Emily, and Jimmy. Provide comfort for the family of William Charles Sturrock by sending flowers.